There is a seamless biking/pedestrian path along the St. Lawrence River, alongside busy Boulevard Champlain. There are good views of the water along most of the way, and a couple of sections where one is on the shoulder of the road. This is a great opportunity to do a nice straight shot run, up to 10 km to the end of the path. 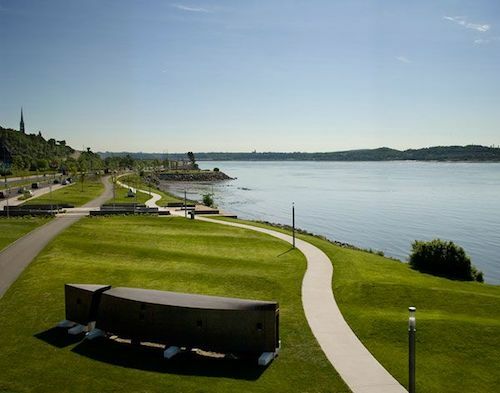 The last 2.6 km are along La promenade Samuel-De Champlain. There are also some good loop options. One suggestion: run the 2.3 km from the Musée de la Civilisation to the Cap-Blanc Stairs, climb 398 of them up to the Plains of Abraham, and take the Promenade des Gouverneurs back (also some stairs).